Vince Velasquez (4-5) gave up two runs – one earned – and fanned nine in 4 2/3 innings. He fell to 0-4 against the Braves. “I worked hard in the offseason. I want good results to happen and it’s happening,” Albies said. Albies walked to start the inning. 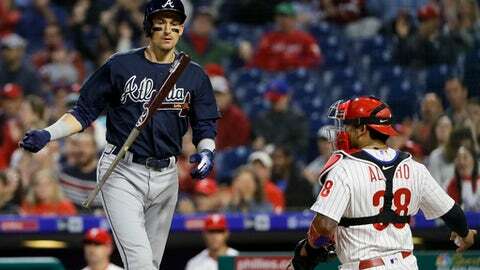 He advanced to third on Freddie Freeman’s single after right fielder Nick Williams threw to an uncovered base because third baseman Maikel Franco was shifted. Freeman went to second on the play. Nick Markakis followed with a bouncer to first baseman Carlos Santana. His throw to the plate sailed over Alfaro’s head for an error, allowing Albies to score. Cesar Hernandez’s RBI single in the bottom half cut it to 2-1. But McCarthy struck out Rhys Hoskins swinging to strand runners on second and third. The Braves missed an opportunity in the fourth when they loaded the bases with no outs on a walk and two singles. Velasquez struck out Dansby Swanson, Ryan Flaherty and McCarthy – each went down swinging. McCarthy said he was merely “decoration” in the batter’s box. “I had no chance against Velasquez,” he said. Phillies manager Gabe Kapler was impressed with Velasquez’s resilience. “It’s a lot of growth for him, took deep breaths out there, really saw him continuing to compose himself which is definite indication of development,” Kapler said. Philadelphia’s rotation has allowed one earned run or none in 11 of its last 15 starts. Atlanta’s rotation has allowed one earned run or none in seven of its last 10 starts.